Micro-finance investment vehicles (MIVs) have been a topic of recent discussion, courtesy the recent book by Hugh Sinclair[i]. 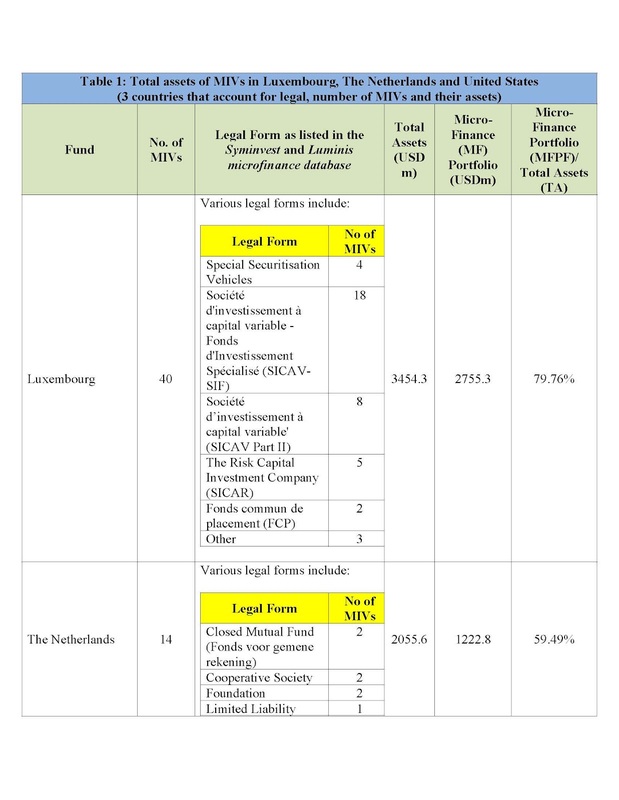 Currently, as has been noted in previous articles[ii], given the state of the microfinance investment vehicles (MIV), it is highly unlikely that they undergo any meaningful regulation/supervision. However, as the recent debate has shown, there is indeed a critical need to regulate/supervise the MIVs. This is because, MIVs – apart from being investment companies and/or financial intermediaries – have very diverse operations in terms of innovative products, geographies and so on. And most importantly, they are able to provide crucial capital to MFIs, who then leverage the same (from commercial banks/others) - manifold – and enhance outreach of their services. Readers may want to recall that much of the impetus for devastating growth of the MFI sector in Andhra Pradesh (AP), which then led to the 2010 crisis, came from: a) MIVs/other investors (irresponsibly?) pumped in huge amounts of money (in relatively shorter amounts of time) into MFIs after the 2005/2006 Krishna crisis; and b) And riding on the back of these investments, MFIs were able to leverage huge amounts of commercial bank lending and grow[iii] (using multiple lending, ghost lending and over lending) at phenomenal rates. This, in short, resulted in the 2010 Andhra Pradesh (AP) micro-finance crisis which is still unprecedented (as of today) in terms of its sheer enormity, scale, and impact. a) “First, with no causality being implied, all I can say is that the period of very rapid growth in Indian micro-finance (April, 2008–March, 2010[iv]) is associated with significant equity investments into Indian micro-finance (US $ 486.58 million). For example, almost 75% of the total portfolio of the top 14 Indian MFIs (with 6 Andhra Pradesh headquartered MFIs), as of end March, 2010, had been accumulated during the period April, 2008–March, 2010. In numerical terms, this is approximately US $ 2.791 billion, which is huge by any standards. During the same period, the big 6 Andhra Pradesh headquartered MFIs also increased their gross loan portfolio by almost US $ 2.077 billion .In other words, the 6 Andhra Pradesh headquartered MFIs accounted for almost 74.41% of the total portfolio (US $ 2.791 Billion) increase for the top 14 MFIs during April, 2008–March, 2010. 13 of the 14 MFIs were NBFCs. b) Further, it is in the same period of April, 2008–March, 2010, that the top 14 Indian MFIS (with 6 Andhra Pradesh headquartered MFIS) added nearly 14.27 million active borrowers. And interestingly, the big 6 Andhra Pradesh headquartered MFIs accounted for almost 9.76 million of these active borrowers (about 68.34%). c) Thus, irrespective of whether growth of active borrowers or gross loan portfolio is considered as a measure, the period April, 2008 to March, 2010, is clearly “The Period” of burgeoning growth in Indian micro-finance. What is noteworthy here is that this period is also associated with significant equity investments of US $ 486.58 million. d) The period, April 2009 – July 2010, which is part of the fastest growth period (of April 2008 – March 2010), shows the highest equity investment in a single year in Indian micro-finance (approximately, US $ 387.30 Million). Therefore, given the above, I think that it is imperative that any kind of MIV (irrespective of its legal form, geography of incorporation, countries of investment etc) should be subject - under its extant laws - to some minimum regulation/supervision[vii] as is required for any form of organization involved in making investments (often collected from investors) and engaging in financial intermediation. 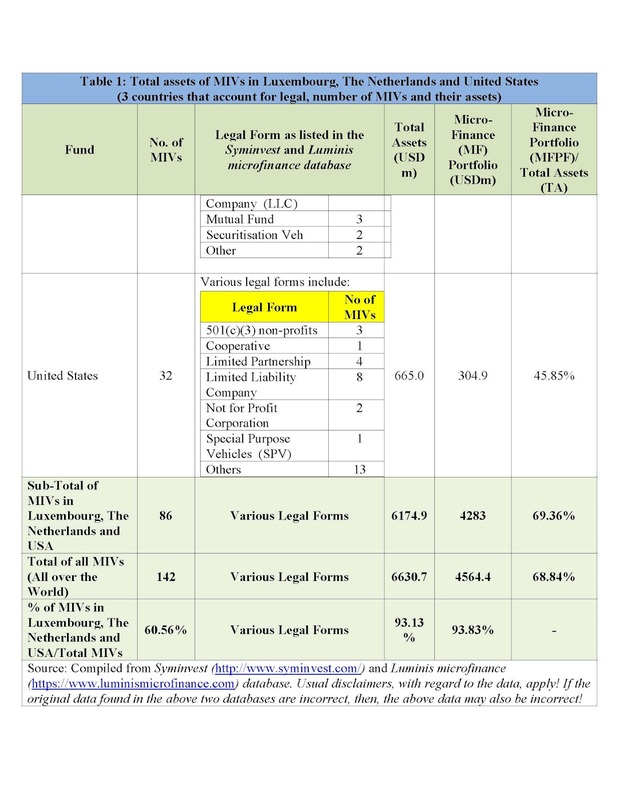 Looking at the assets that MIVs control (Table 1) and keeping in mind the potential damage that they could cause by their irresponsible investments (as was done in India), the case for minimum regulation/supervision becomes very strong indeed. Therefore, given the above background, regulation/supervision of MIVs in (at least) these three countries (Luxembourg, The Netherlands and US) becomes the imperative need of the day. Let us be clear on that! However, it is certainly not an easy task because the issue of regulation across diversely incorporated MIVs (see Table 1) operating in multiple countries would require complex arrangements with a great deal of coordination between regulators across countries. And while that certainly can be a long term goal, let us make a start first and pluck a low hanging fruit here - the SUPERVISION of MIVs by existing regulators/supervisors. Hence, what I am proposing is sort of an immediate solution (or quick win). In other words, what I am saying - in effect - is that let us FIRST make a beginning by creating a framework for enhancing supervision of MIVs by existing regulator’s in these three countries! And regulators in other countries could follow, as dictated by their strategic situation and requirements. While supervision of MIVs should concern levels 1, 2 and 3 primarily, levels 1 and 2 would be most important from a regulatory/supervisory stand point in the home (parent) country. As levels 3 and 4 would require significant coordination with regulator/supervisors in the host country so as to understand the nature of the investee and their operations, these levels are dealt with, separately, in forthcoming articles. And before we get into the levels of analysis issue, one critical point must be made - for all practical purposes, irrespective of wherever the fund or fund managers get investment from, regulating/supervising them at the place of incorporation and/or place at which their establishment exists would be most appropriate. Sometimes, even these could be in multiple countries (as noted earlier) and that needs to be appropriately handled. 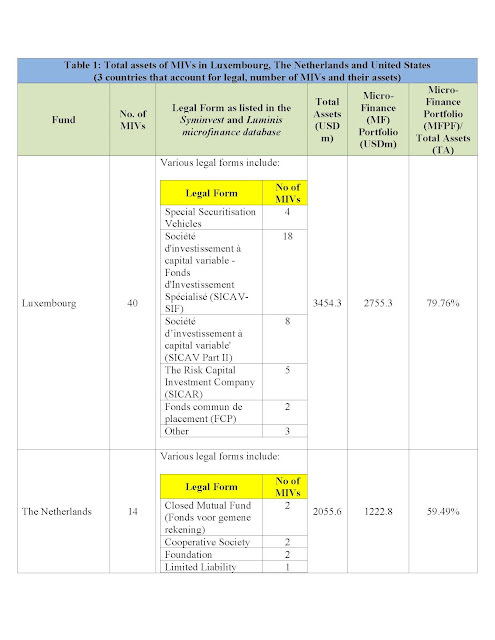 [ii] Why not regulate and supervise microfinance investment vehicles in their country of incorporation? ; Triple Jump’s Response to Hugh Sinclair’s Book: Does It Raise More Questions than Provide Credible Answers? ; Why blame the MFIs alone? ; Should not microfinance investment vehicles be judged by the same standards set for retail MFIs? ; and Does Sinclair’s Open Challenge (to the Global Micro-Finance Industry) Make His Claims True? [iii] See Mix Market http://www.mixmarket.org/ - ‘MFIs, unlike before, were able to deploy funds as micro-finance assets’. In my opinion they did so using multiple lending, ghost lending and over lending and primarily consumption/loans. [v] This issue is almost similar to the aspect of which came first, the Chicken or the Egg? [vi] Source: Quoted from The Journey Of Indian Micro-Finance: Lessons For The Future by Ramesh S.Arunachalam and disclaimers given the book apply with regard to the data! [vii] Regulation is essentially about making rules and/or principles and influencing behaviour and enforcement. Supervision concerns continuous or specific verification of the application of these principles/rules through various mechanisms.